Zubin joined Blackadders in May 2014 as the Lead Investment Manager at our Edinburgh office. Zubin has advised and managed a wide range of investment portfolios for Private Clients, Charities, and Corporates under both Discretionary and Advisory mandates. Zubin provides portfolio construction, investment advice and management which takes account of a client’s broader wealth and financial planning needs, working closely with colleagues throughout other parts of the Blackadder’s organisation to provide a cohesive 360 approach to managing clients financial affairs. 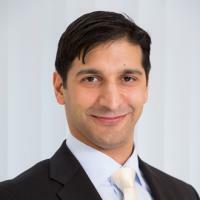 Prior to his move to Blackadders in Edinburgh, Zubin was based in London where he worked as an Investment Manager at Killik & Co. at their Head Office in Mayfair for nine years, and before that he also worked at JP Morgan & Co.
Zubin graduated with a BSc. (Hons) in Economics from Brunel University, London. He holds the Chartered Wealth Manager and Chartered Fellow of the Securities & Investment Institute designation.